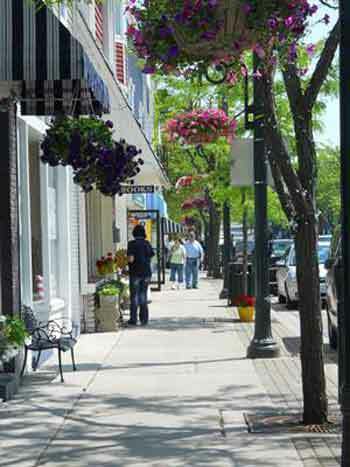 What began as an idea in 1982 to add beauty to the city has been a nationally recognized feat: Charlevoix's five miles of US 31 are lined with petunias each year and they are gorgeous! This year's community planting day is May 26. Planting the petunias takes massive organization. The areas along the curbs where the plants will be are raked to remove winter's salt and dirt accumulations. Next comes fertilizer and tilling. And remember that there are five miles of planting on both sides of the street to prepare. The night before the planting, the ground is watered. On petunia planting day, the ground is ready for the city's handcrafted 16' steel flower hole punch roller. 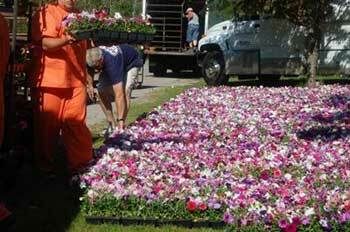 Volunteers drop off 1,200 flats of flowers along the petunia avenue. The official planting day is the Thursday before Memorial Day. More than 1,000 volunteers line the streets to plant the petunias and then celebrate with a picnic in East Park. Throughout the summer season, watering the petunias is a must. A special petunia watering truck drives along the petunia daily to deliver 12,000 gallons of water--daily! Next comes weeding which takes place twice a month. Operation Petunia is unique to Charlevoix. Residents and visitors love the look of the petunias. And, of course, the petunia's perfume indeed makes Charlevoix special!